PrinterTechs long life HP 4250/4350 series maintenance kits contain a fuser that we have upgraded to be more durable than the standard fuser. We have tested our long life fuser to over 500,000 pages, that’s double the life expectancy of Genuine HP 4250/4350 fusers which are rated for 225,000 pages. This kit is available with a fuser exchange, see details below. The kit with the new fuser is a standard life new fuser, we recommend the long-life kit. 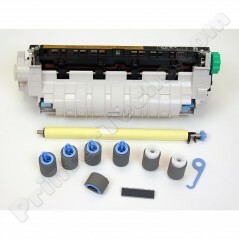 PrinterTechs® upgraded HP Laserjet 4250/4350 Long Life fusers last up to 500,000 pages! That's over twice the Genuine HP (OEM) life expectancy of 225,000 pages and roughly 4 or 5 times the life you get out of the cheap "refurbished" or new aftermarket fusers found ubiquitously across the internet. The fusers in our 4250 4350 Long Life maintenance kits are upgraded and remanufactured by us, right here in the USA. We did the research and development on the parts, we did the testing, we did the quality control. There are no clueless middlemen who don't know where the parts came from or their durability. We have spent years testing and improving the parts we use in our fusers. Our techs take great pride in their work. Also worth noting, we include a GOOD transfer roller. I'll emphasize good because there are a lot of really bad transfer rollers out there including many genuine HP transfer rollers which are printing too light. This is discussed in the video below. Essentially the factory that is making those transfer rollers for HP is not making them to the right specifications, causing light print. The maintenance kit part number is Q5421A, the fuser part number is RM1-1082. The maintenance kit contains a fuser and the rest of the rollers shown in the picture and described above.